This winter has been a brutal one. Many businesses and commercial districts have struggled to keep up with snow removal. Contributor Chris Bernardo, Principal of Commercial District Services LLC, a provider of supplemental services to managers of outdoor public spaces, offers our readers a few valuable tips for dealing with these snowy challenges. As we enter the last few weeks of our most recent winter of discontent and the snow banks scattered around our commercial districts begin to decrease in size and fill the sewer drains with slush water and thawed pieces of litter and debris, it seems like a good time to look back and share some thoughts on snow management in commercial districts. As cities struggle to maintain sufficient levels of police and sanitation services, most Business Improvement Districts (BIDs) have adopted programs that fund supplemental services to provide increased police/security patrols and sanitation/litter removal. In almost all cases, these supplemental services are superior to those that the public sector could provide given the available resources and City budgets that are already stretched to the limit. It’s important to determine if the main commercial strip can accommodate snow piles, if so, you may be able to simply plow the snow from the parking spaces into piles at the end of each block. 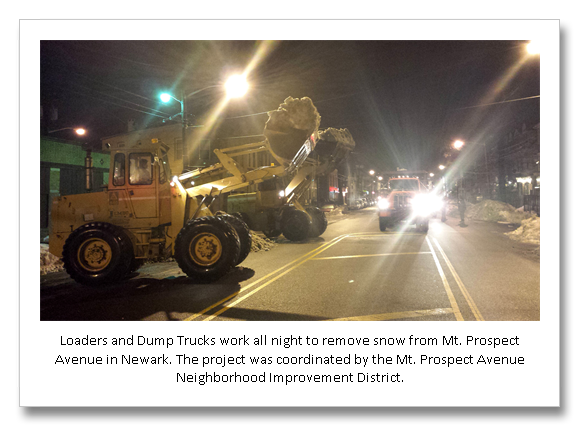 If there is no room for snow piles or they create too much of a hazard, then it will be necessary to physically remove the snow from the district, which increases the cost and coordination needed. Does your city prohibit parking on snow covered roadways? If not, you will need to coordinate an emergency “no-parking” strategy with the City, which needs to be planned for well in advance of the winter. It is advisable to draft a plan and distribute it to property owners and tenants at the beginning of the winter season so that they are prepared to move their vehicles, before being ticketed and towed. Not having a “no parking” plan in place can make or break a successful snow removal strategy. Getting the necessary approvals and coordinating the enforcement of prohibited parking can take longer than is practical. A solid “no parking” plan should include a local ordinance which identifies those specific streets within the BID where prohibited parking will be in effect, an MOU between the BID and local Police Department/Parking Authority stating the mutual commitment of each party to enforcing the ordinance and the understanding that Police personnel/power will need to be deployed in order to enforce the ordinance, ticket/tow vehicles and enforce traffic/street closures. Where will the snow be placed once it is removed from the district? Carting snow is a slow process, a large dump truck with a 20 cubic yard roll-off can take a while to get from point a to b…if it takes 15 minutes to fill the truck and 45 minutes to transport the snow it’s gonna be a long night. It’s important to find a location in close proximity to the district, so that the least amount of time possible, is used to transport the snow. Go big or not all…don’t make the mistake of underestimating the amount of snow that is actually on the street. A large loader is going to remove more snow in a shorter period of time than a Bobcat. In order to have the biggest impact possible for your stakeholders, consider using at least two large loaders and no less than four dump trucks. Be ready to spend between $10K-$15k on an 8-10 hour session, overnight, on private snow removal services in order to have a sufficient impact on the district. Hopefully the tips above will help you plan out the best possible snow removal program for your district! On a smaller scale for dealing with snow…keep your drains clear..so melted snow does not turn into ice and block the crosswalks. ALSO has anyone noticed that the extended sidewalks installed recently do not have the right placement of drains? The snow piles up on the middle of the crosswalk and the drains are not at the corners, but on the sides…really bad…even a better pitch will not accommodate the blockage in the middle. One of several annoying problems that most households meet is during winter months is snow build up. It results to blocked roads, collapsed roofs and many more. Thanks for sharing such kind of valuable information with us.We hope you will share more info about snow removal services. Please keep sharing! Thanks for sharing such kind of valuable information with us.We hope you will share more info about snow removal services.